The town of Greenwich derives its name from Old English, meaning 'green harbour' or 'port'. It became popular in the 16th century, when Henry VIII holidayed there, and its popularity with royalty and gentry increased during the reign of Elizabeth I, who quarantined herself from the Black Death in the Queen's Palace in Greenwich Park. 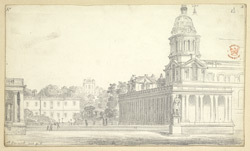 This drawing shows the collection of buildings that constitute the Royal Naval College, a superb Baroque pile designed by Sir Christopher Wren. The site was formerly the Greenwich Hospital, established in 1694 by Royal Charter for the support of seamen and their dependants. The hospital remained in operation until 1869 when it became a training centre for the Royal Navy. Today the site is occupied by Greenwich University and Trinity College of Music. King William Court, seen to the right in this drawing, possesses one of the greatest painted halls in Europe. Sir James Thornhill was commissioned to paint the hall, which took 19 years to complete. It is said that the artist was not entirely happy about the late payment for this monumental task, and has pictured himself on one of the walls holding out his open hand to the King. The Royal Observatory is one of the world's most important scientific locations. It sits on the Prime Meridian Line and is home to GMT (Greenwich Mean Time). The site was founded in 1675 by Charles II and is the official starting point for each new day, year and millennium.